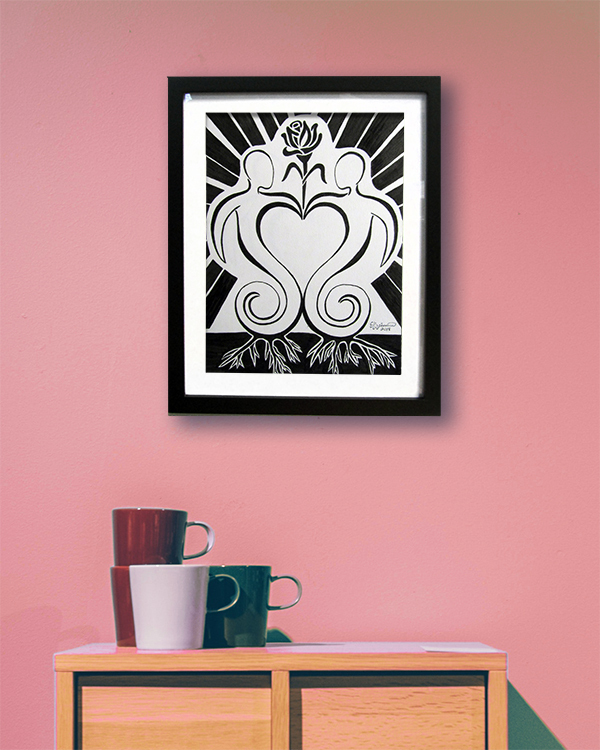 Soulmate Union Light is a black graphic arts pen drawing of two figures with a rose blooming from their joined hands, roots growing into the Earth, and rays of light emitting from them. I started this piece without much of a plan, other than I wanted to have two figures form a heart. The rest evolved as I went. I created it in 2018. It is 9″ x 12″. The frame is 11″x14″ with an 8.5″ x 11″ mat opening. See Additional Info for details. Purchase includes frame (and mat), as well as a certificate of authenticity. Standard Shipping is FREE!